Last week I posted about the Cheesecake Cohousing Consortium–an 11 person senior community located in Mendocino, CA. The post proved very popular, but a number of commenters remarked about the dearth of urban housing options that perform many of the same things that Cheesecake does–namely provide affordable, compact, interdependent and social living. 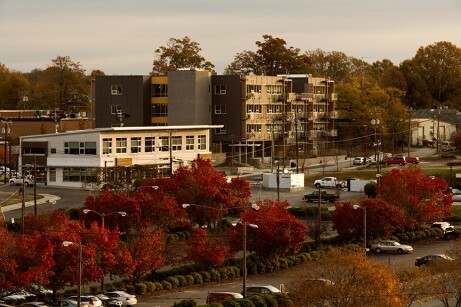 In researching Cheesecake, I ran across Durham Central Park Cohousing in (you guessed it) Durham, North Carolina, which seems to fit that bill. While not a San Francisco or New York in terms of urban density, with its 245K people, Durham is a lively mid-sized city, one that has a booming social, artistic and cottage commercial industry. CP Coho is located right in the middle of town, making it easy for community members to access those assets on foot. The four story building was designed by Weinstein Friedlein Architects and completed late last year. The first floor is occupied by a common dining room, kitchen, great room, meeting rooms, performance space and gardens. There are also shared guest bedrooms, enabling people to live without dedicated guest rooms in their personal apartments, which are often only used a small fraction of the year. The three upper floors contain 24 units ranging from 850 and 1700 sq ft housing a total 37 people. 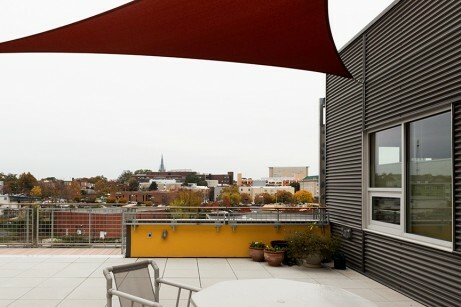 Each self-contained unit has its own balcony and there is a large shared patio on the roof. Though not strictly a senior community, judging by pics of its members, the community is made mostly of people of fifty years and older (they do state that a family lives there with one teenager). 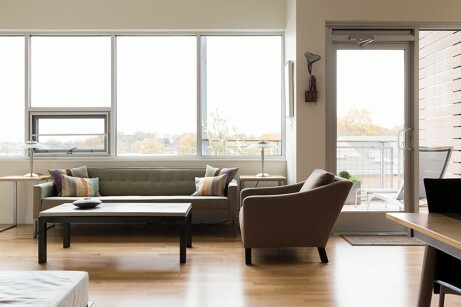 On their website, they mention that the community is designed around the “aging in place” principle, and the building was designed with universal access to accommodate community members as they become less nimble with age. Whereas many cohousing communities use existing structures or enlist developers to handle the design and construction of their new building, CP Coho members self-developed their building according to a Citylab article on cohousing and boomers. That said, all units are owned outright as condos. One member told Citylab that the cost of each unit was not affordable per se, but it was comparable to other market offerings. I dug around a little and found most units sold in the low to mid $400K range (I emailed the community for other monthly expenses, but haven’t heard back yet). CP Coho has a lot going for it. Units are reasonably sized, neither too big or small. The whole building sits on a mere .58 acres, contributing to the urban density and walkability of Durham as a whole. The building itself is pretty good looking and has a number of energy-saving features like solar water heaters. Most importantly, the building has socialization built into its DNA–a critical aspect for people of any age, but particularly older adults, who are more at risk of becoming physically and socially isolated. These merits explain why the building was fully sold out before construction even began. I’ll keep looking for other great project like these (valuable research before I need to start or move into one myself). If you live near Charlotte, NC, we are working to develop a cohousing community for all ages and stages! 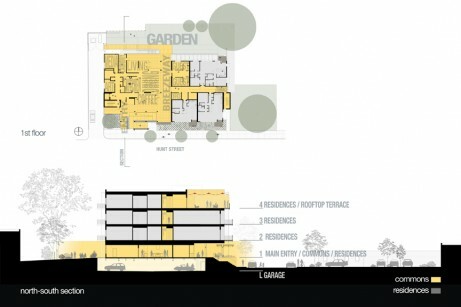 http://www.cohousing-charlotte.com. OK. How about AFFORDABLE co-housing? Some of us haven’t a prayer of ever coming up with $400,000 or anything close to it. 400k might be a reasonable price in SF or NYC, but in Durham this is the high end of the real estate market.